SOME parts of the economy are facing a shortage of skilled workers which, if the posts are left unfilled, could result in rising costs, project delays and a slowing down of business. And the problem is growing, according to latest official data. There were a record 63,900 vacancies logged in June, nearly 12,000 more than a year earlier, according to Manpower Ministry statistics released yesterday. Financial services and health and social services saw at least 1,000 more vacancies each, although the lack of skilled workers is most acute in the construction and manufacturing sectors. Recruiters and employers flagged mid-level skilled staff such as engineers, nurses and crane operators as highly sought after but difficult to find. Previously, such positions could be filled by foreigners with relevant skills. But increasingly, with the tighter rules on foreign manpower, companies find that they have to turn to local workers instead, said Ms Linda Teo, country manager of recruitment firm ManpowerGroup Singapore. However, employers are finding it hard to hire local workers as many do not have the technical skills required, said Mr David Leong, managing director of recruitment firm PeopleWorldwide. "Not enough people are taking up courses in applied skills, despite there being enough training capacity in education faculties," he said. The crane industry, for example, is in dire need of fresh blood. 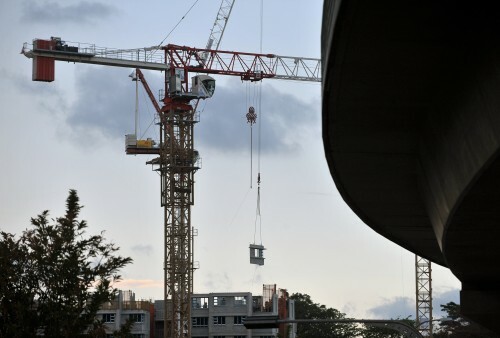 Seven in 10 crane operators are aged 40 and above, and few young Singaporeans are interested, said Singapore Cranes Association (SCA) chairman Alan Chan. "As locals get more educated, the majority don't want to be in this trade where you don't wear long-sleeved shirts and a tie," he said. This is despite salaries of up to $7,000 a month. Even engineering has lost its shine, with people choosing the finance and service industries instead, said Mr Leong. "A lot of good engineers end up selling property or insurance," he said. To make career pathways clearer and more accessible, Deputy Prime Minister Tharman Shanmugaratnam will be chairing a tripartite committee for the development of an integrated system of education and training for all Singaporeans. In the meantime, however, bosses like Mr Chan said that if the skills shortage continues, construction projects are likely to take longer to complete. Another consequence across industries is that wages are being pushed up as employers strive to attract locals and grapple with higher minimum salaries for foreign work pass holders. While this may be good for employees, it raises costs for firms. Industry associations also warn that the lack of skilled workers may force companies that cannot compete to scale down, shut down or move out. "Business costs are getting higher and productivity has not grown at the same pace as the foreign manpower curbs and wage increment," said Singapore Business Federation chief operating officer Victor Tay. And in certain industries, higher wages do not seem to make a difference. Mr Sam Chee Wah, general manager of precision engineering firm Feinmetall Singapore, said the starting pay for machinists has gone up by $500 but they are still hard to hire. "So we're trying to become less labour-dependent - the process has to adjust to people."